The car-sharing service is attempting to fill in gaps in areas it services. It also has added 150 Mini Clubmans to its fleet, which has grown to 520 cars strong. BMW’s car-sharing service is expanding into the Seattle areas it promised to reach when the service launched two months ago. ReachNow said Tuesday it is now live in West Seattle, Magnolia and parts of Southeast Seattle. The company has also added 150 Mini Clubmans to its fleet, now 520 cars strong. BMW launched ReachNow in Seattle in mid-April and established the service’s headquarters in the city, with former Inrix executive Steve Banfield as CEO. ReachNow allows drivers to use an app to reserve a car, which they then can drive to designated Seattle neighborhoods and park in any legal parking spot. 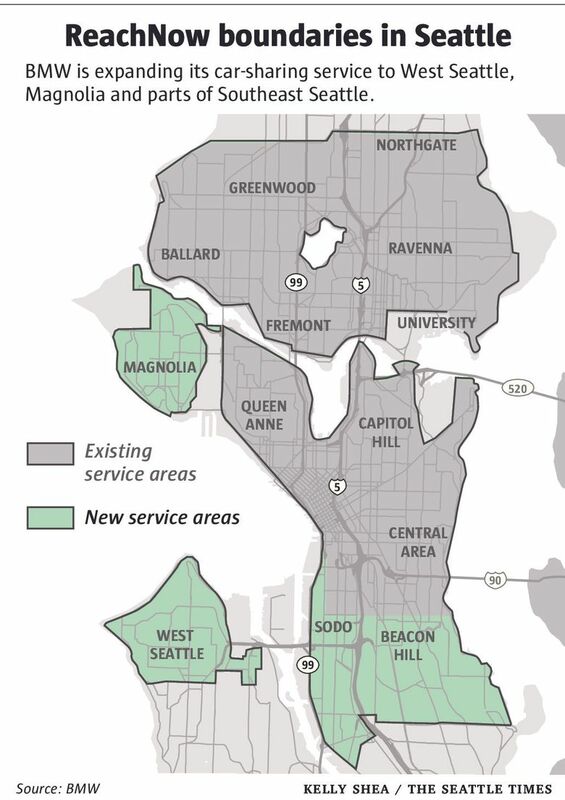 Drivers can now pick up and drop off cars as far south as South Orcas Street, which includes the Mount Baker, Columbia City and Beacon Hill neighborhoods. The service extends south to Southwest Alaska Street in West Seattle, encompassing the Alki and North Admiral neighborhoods. “This rapid increase in the size of our fleet and expansion of our Home Area is a true testament to Seattleites’ willingness to embrace new technologies and services as they travel to and through the city,” Banfield said in a statement. BMW said it intends to keep expanding ReachNow in Seattle, including to neighborhoods such as Rainier Valley that are farther south of the new boundary. A company spokesperson said ReachNow will expand to the areas over time as it adds more cars. ReachNow said in May that it also plans to allow cars to be picked up at Seattle-Tacoma International Airport. The company didn’t have an update on timing for that Tuesday. Seattle has become a hotbed for alternative transportation options, including chauffeured driver services, as well as competing car-sharing companies. In May, BMW said more than 13,000 people had registered for its program in the first month. Competitor Car2Go, an Austin, Texas-based company that operates a similar service with Smartcars, said at the same time that it had more than 77,000 members in Seattle. The two services are facing increased competition from Zipcar, another car-on-demand service that was long thought of as being in a different category because its cars had to be picked up from and dropped off at the same location. Zipcar said earlier this month that in Seattle it would offer the ability to pick up a car in one designated lot and drop it off at a different lot. Zipcar also launched a pickup and drop-off lot at the airport.